The sources and the approach to this research project we found in three distinct levels of research available on the topic of Transgender fashion models and the proposed solution these authors and myself have presented. The first level of analysis focused on the journals and periodicals found the right problem of Transgender fashion models. These articles are from a variety of sources including digital based magazines, books in print, and peer-reviewed academic articles that must fit the criteria of a publication date ranging from 2015-2018. The current materials needed to be used to show the relevance of the problem in today’s fashion market to explain the urgency of the problem and its awareness as of the current time frame. 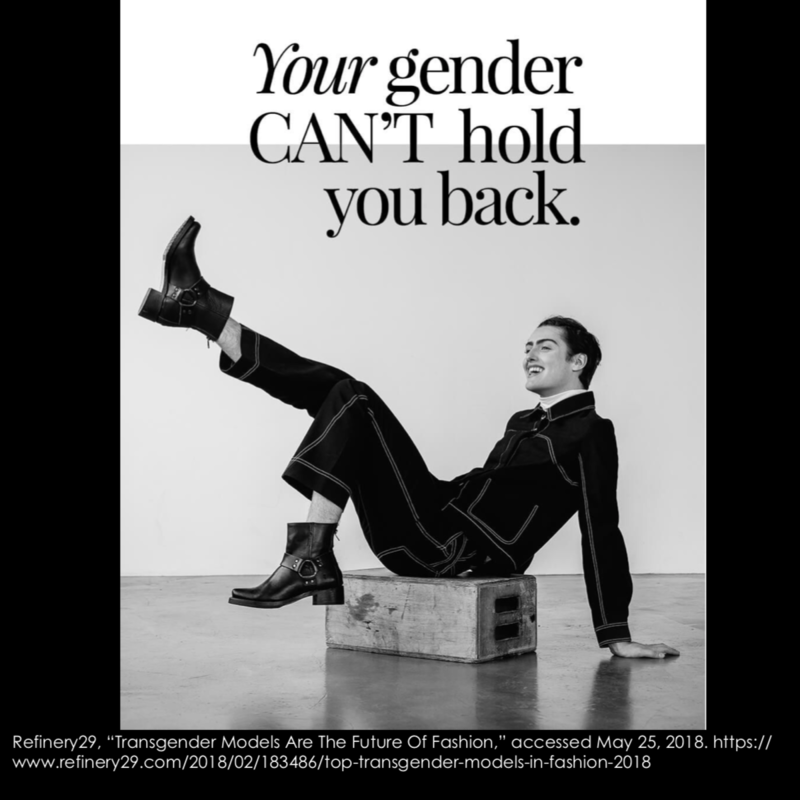 Once this research was in place, it led me to clearly define and understand three topics to understand the subject of inclusivity of Transgender fashion models. These topics were an understanding of the Transgender community and the discrimination they face in the social arena, the standard modeling career path that is not shared by Transgender models but available to cisgender models, and the proposed solution of using social media and new media marketing techniques. The research of the Transgender community led me to books in publish reaching back to 2012 to understand terms used by the community. To help support these terms I used an academic database search for Transgender discrimination, Transgender fashion, and Transgender with the date range of 2015-2018. I discovered that the terms reflect the information gathered from older books in publications and supported my understanding of the Transgender community and the struggles that are unique to this population. I have added the most common terms in the background section. The next group of research texts focused on the model who pursues this line of work. This literature ranges from 2004-2018 as the modeling industry saw a change in the early 2000’s with the use of digital media. These resources focused on the career path used by cisgender fashion models and the unique difficulties found in the fashion modeling career path. I wanted to gain a solid understanding of this subject to help differentiate struggles that are common among the cisgender model career path and the efforts common to the Transgender model career path. This comparison and distinction helped lay the foundation of where these two populations diverge to focus on where the problem of inclusion can is discovered. The final round of research focused on the proposed solution presented by myself and others who have researched this topic previously, the concept of using social media as a platform for self-promotion. The most useful resources on this subject came from college academic textbooks on the issue focusing on social media fashion promotion. These books created a framework to research and validate the proposed solution presented by previous researchers. These academic textbooks also concentrate on other marginalized groups within the fashion industry to share the success of social media campaigns to bring awareness and inclusion from these communities into the fashion modeling world. 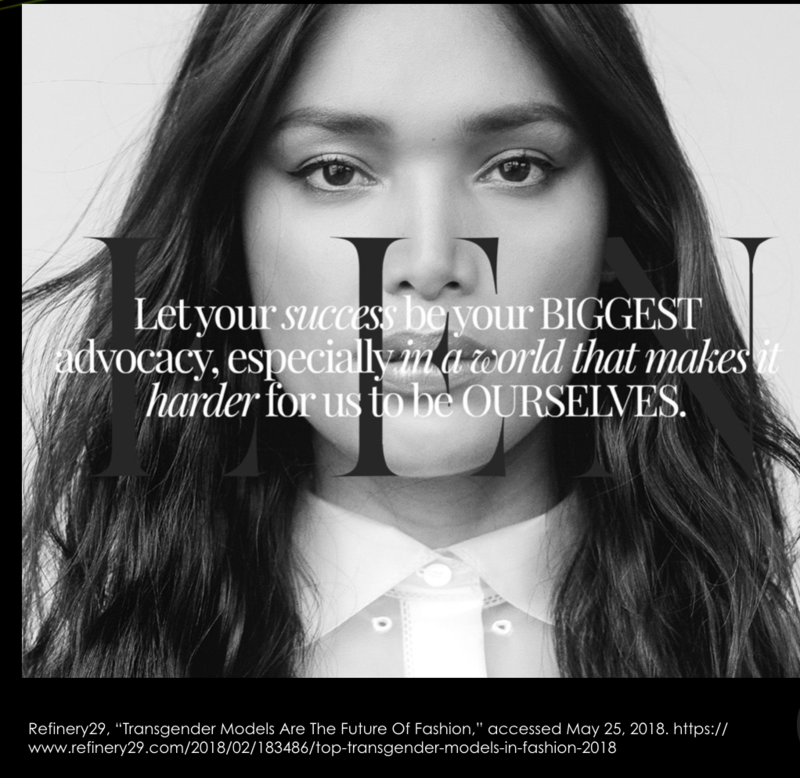 These topics and levels of research help gain a broad view to validate if the problem of Transgender model inclusion in the fashion modeling industry is still in existence. The next focused was on the unique struggles within the Transgender community in their professional and social life. The understanding of the areas of differentiation in the model career path to gain an understanding of a solution. Finally, to research to the proposed resolution of social media marketing to test validity if this proposed solution is sound. Keegan, Cael M. 2016. “Revisitation: a Trans Phenomenology of the Media Image.” MedieKultur: Journal of Media and Communication Research 32, no. 61. MacPherson, Marko, Shawn Dahl, and Nicole Phelps. 2017. Digit@l Girls : Fashion’s New Tribe : Risk Takers, Rule Breakers, and Disrupters.” New York: Rizzoli. Volmers, Eric. March 9, 2018. “Aiming High in The World of Fashion; ‘An Incredible Story’: Trans Model’s Journey from Instagram to Paris.” Edmonton Journal, Accessed April 20, 2018 https://search-proquest-com.du.idm.oclc.org/docview/2012383240?accountid=14608.